Ok... so when it comes to Pokemon I'm a die hard lover. And well the movie is decent. And a little bit more relaxing. And have sometimes some funny moments. Story 8: There is no great story in this movie. The story is based on Pikachu and Togepi. So no Takoshi and others are in this movie. Not to bad but just be prepared. Art 7: This art is just basic pokemon art. And sometimes to much cartoony wich i Dont really like. Sound 7: There is not really a opening and ending. (atleast what if seen) But the sounds effect are just good. Enjoyment 8: Was good enough to watch and will recommend it to people to watch. Its just a simple serie about hide and seek what the info already says. With a 8 I will recommend to you guys to watch this. Its fun and just a chill anime. Means not alot of action and simple to follow. I'm happy to report that this short isn't anywhere near as bad as the movie it comes with. However, it's not that hard to be better than 4Ever. So let's see if this short is actually worth checking out. Story: The story is nice and simple. It's mostly just Pikachu playing hide and seek with other Pokemon. Nothing remarkable, but it didn't have to be considering it's just supposed to get you ready for the movie, which it does. However, I did like that they changed it up at about the half-way point. Art: Given the concept of trying to make the Pokemon blend in with their surroundings, the artwork should help work this in, which it does beautifully. What's even better is that the small amount of CG that they do use for the short is either used to help point out where certain Pokemon are due to how well they blend in or for a more cartoony look. 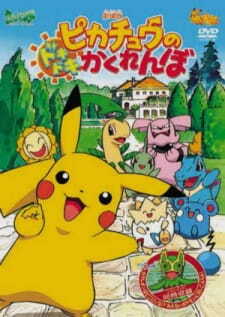 However, the artwork isn't as good as other Pokemon shorts, like Pikachu's Rescue Adventure. Sound: The soundtrack is pretty good, sporting a few tracks that I actually wouldn't mind listening to outside of the short. However, they're not as creative as other shorts. Character: The only character I can really talk about is the narrator. My problem with him is the same as my problem with the narrator in Slowking's Day, that being he only tells us stuff we already know. So the short could have worked without him. As for everyone else, I did like seeing how seriously Larvitar takes his job while also being laid back at times. Enjoyment: Considering the movie that this short comes with, this is the only reason to bother purchasing the movie (if you can find one that still comes with the short that is). However, being that this is the internet, you can just watch the short without showing any support for the movie, which I highly recommend. It's funny, cute, and entertaining, so give it a shot.